UAVs will be the major force multipliers in the future battles, as they are not only economical to develop and maintain than the conventional war fighting machines but also reduce the risk of human life. In recent years, the capabilities of unmanned vehicles have been employed over a larger spectrum of combat and civil/commercial roles which in turn has driven the UAV market. Unmanned Aerial Vehicles (UAV) known as Drones or Remotely Piloted Vehicles (RPVs), and, more recently termed as Unmanned Aircraft System (UAS) simply can be described as a vehicle that operates without an onboard human presence, is either autonomous or remotely operated and is used for ISR activities and combat support role. These will be the major force multipliers in the future battles as they are not only economical to develop and maintain than the conventional war fighting machines but also reduce the risk of human life. In recent years, the capabilities of unmanned vehicles have been employed over a larger spectrum of combat roles, including armed-combat support with remarkable success, which in turn has driven the major defence industries to develop a whole new portfolio of weapons specifically designed for use on future unmanned combat vehicles. Besides UAVs have great potential in law and order management, border monitoring and coastline surveillance Agriculture, Land surveying, Film making, Inspection of Labour forces, 3-D Modelling of Building and landscapes and also special areas like studying the craters of active volcanos etc. The diversity of applications has resulted in the development of a wide range of different types of UAV depending on role and application. With the growing importance of UAVs in the 21st century battlefield, the countries of the world is seriously thinking to replace the manned platform with unmanned platform in substantial numbers providing lucrative opportunities for the manufacturers of the UAVs. As per the recently released data by SIPRI, a total of 1,574 UAV transfers have taken place across the world between 1985 and 2014. Of these, 16 were armed UAVs. Note worthily, UAV trade recorded an increase of 137% between 1985 and 2014. The period between 1985 and 1990 saw sales of 185 UAVs globally, which increased to 439 between 2010 and 2014. 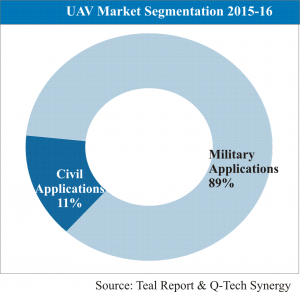 Presently, the global UAV market is largely dominated by the military segment with the technical capabilities of UAVs. A robust demand from civilian/commercial segment in coming years is expected to lead to the significant changes in the structure of the market. 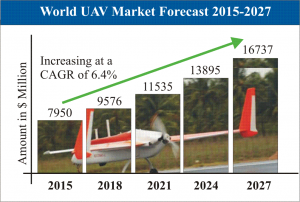 The global UAV market is forecasted to be worth $7.95 billion this year and is expected to grow by 6.4% CAGR over the next ten years, reaching US $16.73 billion by 2027. UAVs form a critical layer in the integrated defence system that the three Indian defence services are now implementing in coordination with one another. Though UAVs have been in service with the three defence services in small numbers since the late 1990s, their mass scale adoption and integration with existing and projected fighting systems has begun in earnest only in the last couple of years. 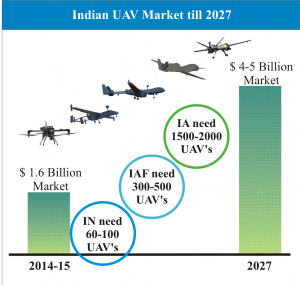 Thus we can say that the India's UAV market is still in its early stages of lifecycle with robust growing prospects. After China and Japan, India is emerging as one of the key markets for UAVs in Asia-Pacific region. With the growing importance of UAVs in the 21st century battlefield, the Indian Armed Forces are looking forward to reduce the high ratio of manned platforms from present 95% to 50% by 2027 and beyond in a phased manner. Refer Fig. At present, Israel is the leading supplier for UAV systems and related equipment in the Indian market. With increasing procurements of UAVs by India's defence forces, players from countries such as U.K., France, Russia and Germany are expected to tap the Indian market. Further, considering the UAV applications, there is and will be huge demand for UAVs for military/homeland application accounting for majority of the share. Other than military/homeland application, law enforcement is emerging as a key application for UAV owing to the significant growth in crime rate especially in metro cities. Additionally, before the imposed restrictions on the use of UAVs for civil application by Directorate General of Civil Aviation (DGCA), mini-UAVs have been used for application related to events. By 2016, DGCA is likely to introduce new set of regulations on the usage of UAVs, subsequently fueling the demand especially in retail and hospitality sectors. Till date, India has bought UAV platforms worth approximately $1.5 Billion (Rs 8250 crores). There exists a huge demand for UAVs in not just the defence but also in homeland security and for civilian use. Keeping in mind, the projected and growing requirement of the three defence services - IAF: 300-500, IA: 1500-2000 and IN: 60-100 coupled with the recently issued tenders for acquisition of various types of UAV platforms by the Indian MoD, the Indian UAV market is expected to be about $1 Billion in the next five years and $4 to 5 Billion in the next 10 - 15 years. Recently, the Government expedited up the acquisition of 10 Heron TP armed drones from Israel's state-owned IAI worth USD 400 Million for the IAF. Fitted with weapons to engage targets on the ground, these drones are slated to be delivered by late 2016 giving the IAF deep-strike capability. As of now, it is not clear as to what kind of weapons will be fitted on these Heron TPs. The project has been revived and fast tracked by the Government in early-2015 and in Sept the procurement was finally given approval. Also, it has been reported that a delegation from IAI has been holding talks with the Indian Defence Ministry to determine the possibility of local manufacture of the Heron TP as part of the "Make-in-India" programme. Also, lately, clearance has been given to the acquisition for 65 micro UAVs or spy drones worth Rs 27 Crores for IAF's Garud Commando Force. Apart from the foreign programmes, some of the on-going indigenous development UAV programmes undertaken by DRDO and the private sector has shown great interest in the design, development and manufacture of UAVs. Some companies such as TATA, Idea Forge, MKU, TAAL, Speck, Alpha Design, Dynamatic Technologies, Coral Digital Technologies etc have taken steps to develop UAVs on their own or with technology collaborations with global OEMs. Recently, Aurora Integrated System (AIS), a subsidiary of TASL has been awarded the tender worth around 50 Lakhs for supply of 49 mini UAVs (+ Option Clause) to Indian Army having qualified through a competitive bidding process. AIS have received the supply order from Northern Command for its system Aquilon. Creation of an integrated UAV/DRONE policy outlining the manufacturing standards and quality control process. Creation of Technology Development Fund for SME. Creation of National Oversight Body having various stakeholders like Armed and Paramilitary Forces, Department of Science and Technology, Ministry of Urban Development and various industry bodies.